In this era of Congressional intransigence, Obama should be encouraged to exercise his constitutionally mandated authority when it comes to a wide range of needed changes. What executive actions would you like to see him to hand down? What do the successful “Mini-DREAM Act” policy and last year’s executive order capping student loan payments have in common? They didn't require the approval of Congressional Republicans. And what do finally ending the War in Afghanistan, directing the EPA to regulate carbon and methane emissions, and ratcheting down the War on Drugs have in common? They wouldn't require the approval of Congressional Republicans. Progressives should take note. In this era of Congressional intransigence, Obama should be encouraged to exercise his constitutionally mandated authority when it comes to a wide range of needed changes. 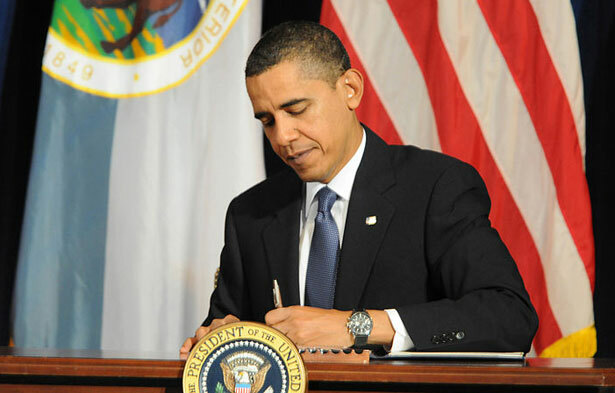 Although the expansion of executive power, particularly after 9/11, has led to a number of dangerous policies–and we do not wish to see a further consolidation of such authority–there is a time and place for the president to issue executive orders that seek to realign the country with its values and with the needs of Americans. A presidential executive order, briefly defined, is an action taken by the president that carries the force of law. It can be used to establish a commission–such as the Hurricane Sandy Rebuilding Task Force ordered in December; to impose sanctions on a country–such as Iran; or to revoke previous executive orders–such as President Bush's 2007 authorization of enhanced interrogations. Other executive actions include directing federal agencies to enforce certain rules, or making appointments to said agencies. As President Obama prepares to be sworn in again and to deliver his State of the Union address, what executive actions would you like to see him hand down? Let us know here, and we'll publish the best suggestions in an upcoming issue of The Nation.